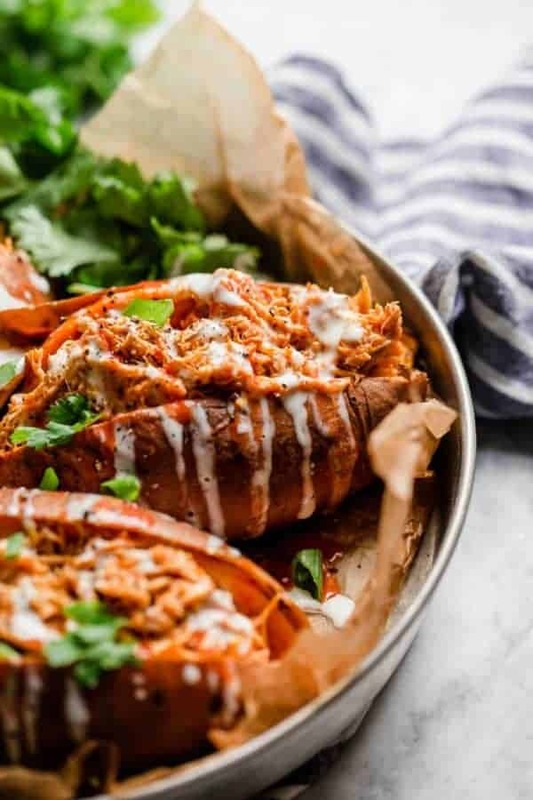 Slow Cooker Buffalo Chicken Stuffed Sweet Potato is where it’s at! A hearty slow cooker recipe for all you buffalo chicken fanatics. Here’s a recipe for you to add to you dinner menu this week. The mix of heat from the homemade Buffalo sauce with the coolness from the homemade ranch creates one insanely delicious combination. It gets better because this slow cooker buffalo chicken recipe uses simple and clean ingredients and it’s quick to prepare. You’ll need about 10 minutes of prep time to make the homemade buffalo sauce, throw the ingredients in a slow cooker and to whip up the homemade ranch. When you come back in 4-6 hours all you’ll have left to do is bake (or pressure cook) the sweet taters and shred the chicken. Pretty easy, huh? No need to complicate things here. If you love buffalo chicken wings as much as my hubby does, this recipe is for you! I consider this a ‘man-friendly’ recipe. While this isn’t a chicken wing recipe per se, it most definitely will satisfy that ongoing craving for ‘wing sauce’. And even if you’re not a buffalo chicken wing fan (like me), I think you’ll be pleasantly surprised at how much you like this recipe, too. And the sauce? Oh, the sauce. So good. Homemade Buffalo Sauce is simple to make too – just good-quality ghee, hot sauce and a few other pantry staples. Looking for easy and convenience? 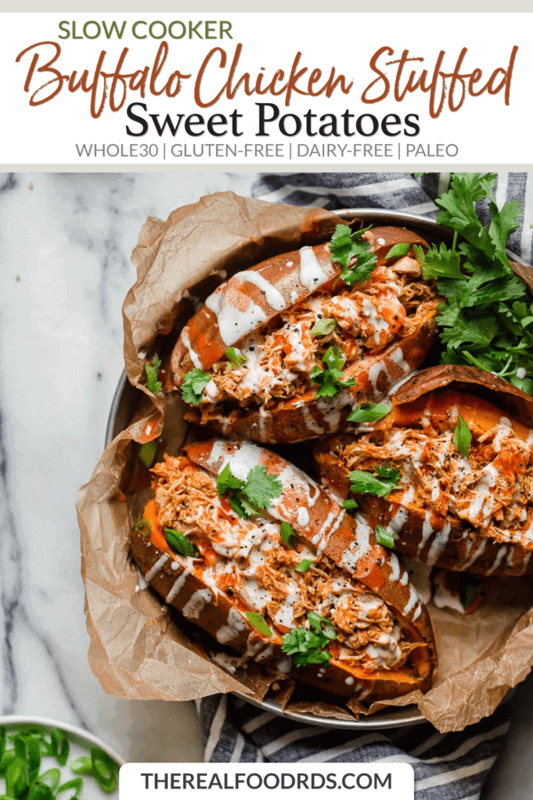 This recipe also works great with Tessemae’s Buffalo Sauce or The New Primal Buffalo Sauce both of which are Whole30 Approved. 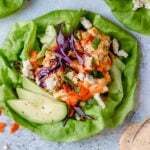 If you’d rather serve the slow cooker buffalo chicken in a lettuce wrap or in a regular baked potato – by all means, go for it! Slow cookers are not just for fall and winter. Both Jess and I use our slow cookers all year round. Why? You might ask. Here are a couple of reasons. On hot and humid summer days, using a slow cooker will eliminate the need for using the oven and raising the temperature inside your home requiring your air conditioner to work even harder. Summer is BUSY! Slow cookers are convenient and make meal preparation less of a hassle. You’ll have more time to spend on summer activities you enjoy…or on the never ending yard work. You can ‘summer up’ any slow cooker meal by pairing it with a fresh salad or in-season veggies from the garden or Farmers market. 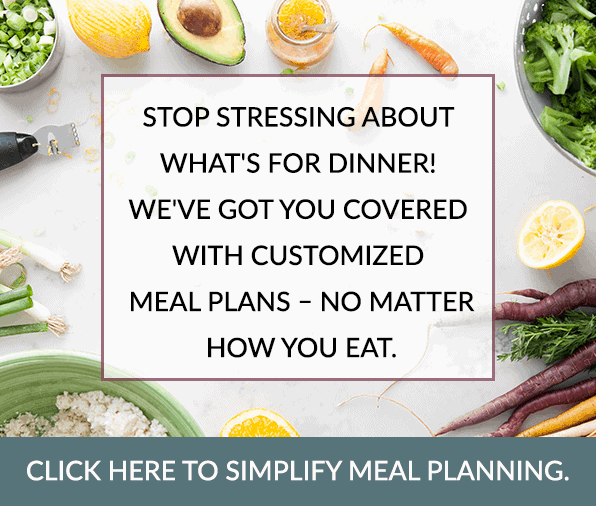 For example, our slow cooker chicken tacos is a perfect recipe for a Build-your-own taco night with all of the fresh fixings. 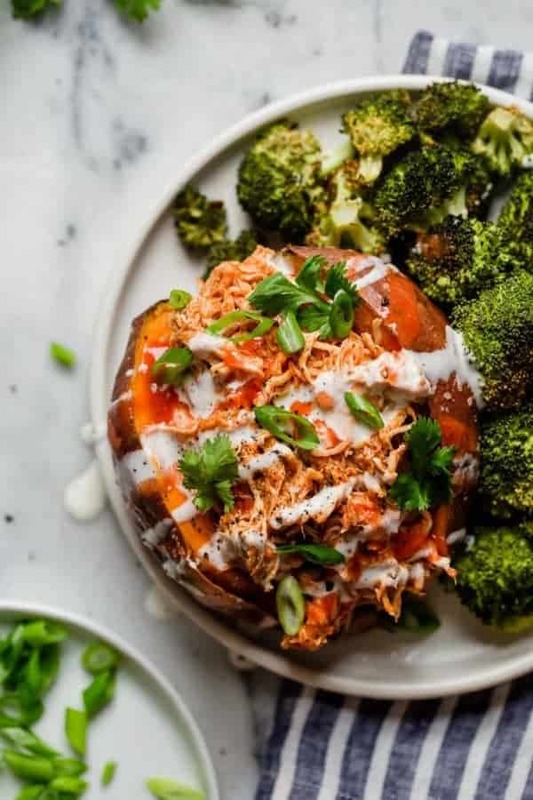 Stuffed in a sweet potato and drizzled with ranch makes for one mouth-watering and insanely delicious meal. 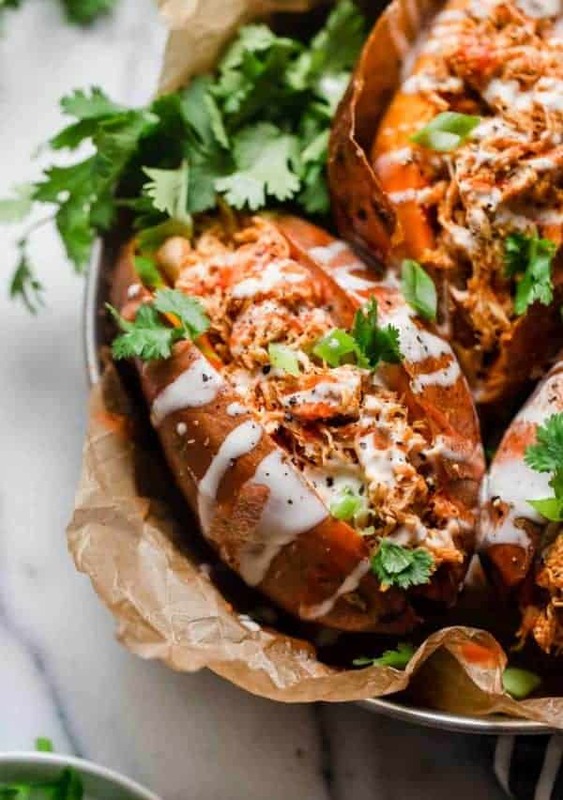 Stuffing the slow cooker buffalo chicken inside of a perfectly baked or grilled sweet potato tones down the ‘kick’ that comes from the Sriracha. However…..if you like the ‘kick’, by all means add a little cayenne to the sauce – see recipe. And then the ranch! Oh the ranch. 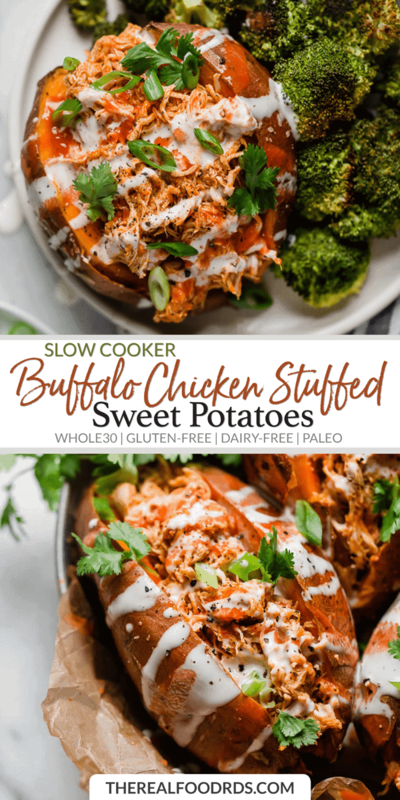 This is a must try dairy-free, paleo-friendly recipe and it pairs so wonderfully with this slow cooker buffalo chicken. You’d be missing out if you didn’t take the 5 minutes to make this homemade ranch. Plus, you can use leftovers on summer salads or as a fresh veggie dip. Heck, you might as well double the recipe. Is your mouth watering yet? Mine is! Give this recipe a try and let us know what you think! 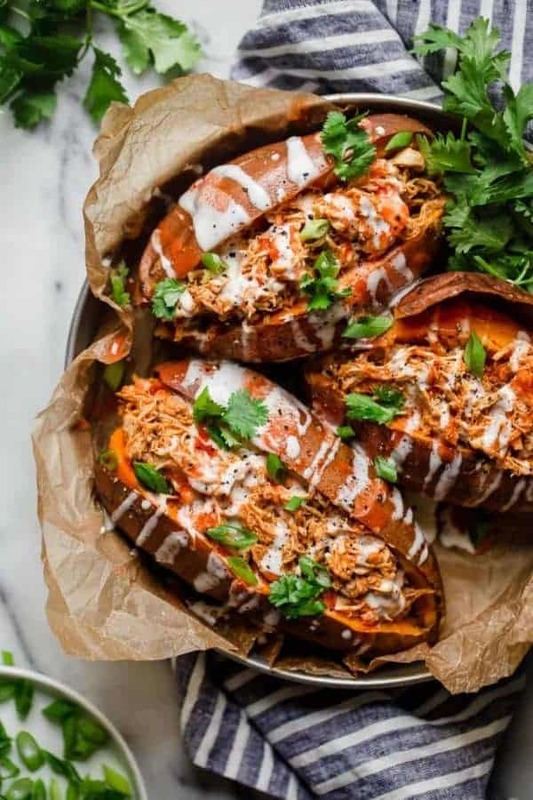 A hearty and healthy, whole30-friendly, slow cooker buffalo chicken that’s shredded and stuffed inside of a perfectly baked or grill sweet potato. A recipe for all you buffalo chicken fans. Place chicken in a slow cooker set on low. In a small saucepan on medium-high heat, combine the hot sauce, ghee, coconut aminos, garlic powder and optional cayenne. Stir together and heat until ghee is melted. Pour sauce into slow cooker. Cook for 4-6 hours on low or until chicken is tender. Remove chicken from slow cooker and shred with two forks. 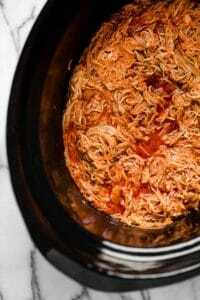 Return shredded chicken to slow cooker and toss with sauce. Turn slow cooker to warm (or remain on low) until ready to serve. Serve chicken in baked sweet potatoes and drizzle with buffalo sauce and ranch, if desired. So tell me, do you use your slow cooker all year round? Comment below. Yum! Love the idea of pairing the buffalo chicken with a sweet potato. These look delicious! It’s such a good combination. 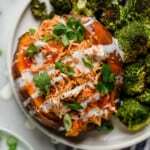 I’m not normally a buffalo chicken fan but adding the sweet potato is a game changer in my book! So good. Is sriracha sauce really whole 30 compliant? I’m surprised! Hi Michelle! Great question. We’ve included a link to a Sriracha sauce recipe that is indeed Whole30-friendly thanks to NomNom Paleo! 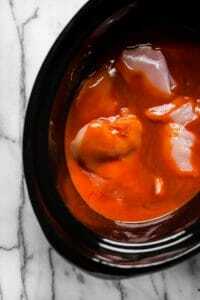 Or here is a Buffalo wing sauce you could use in this recipe…http://www.tessemaes.com/products/hot-hot-sauce. Hope this helps! Hey there! I noticed you have ghee listed in the directions but not in the ingredients. How much did you use? We don’t have any but I’m assuming coconut oil or butter would work in its place.. Just curious how much to use. Thanks! This is great, and to answer a previous question the original Frank’s hot sauce is whole 30 compliant. I can see myself making this often as I just bought a truck load (just kidding) of boneless skinless thighs from Costco. Ha! I love that you also referral to your chicken thigh haul from Costco as a ‘truckload’! I just stocked up too in preparation for back-to-school week and this Buffalo chicken is definitely on the menu at our house too! Calling this recipe “dairy-free” is a little misleading since it contains ghee. The recipe has been updated to include coconut oil as a sub for those that wish to avoid ghee. 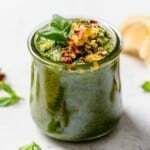 However, because of the way ghee is made, most individuals who follow a “dairy-free” diet can tolerate pure ghee because the lactose and whey are removed. You’re not blind – we changed the sriracha to Frank’s Red Hot sauce in the ingredients but forgot to change it in the directions. You can certainly use sriracha if you’re not doing a Whole30 – both work great (but only the Franks is Whole30-legal). NomNom Paleo has a AWESOME sriracha recipe. I’d never had sriracha before, and now I have a freezer full of Whole30 compliant sriracha made from my own garden-grown red jalapeños (they are too hard to find in the stores IMHO). I’ll never be without it again! Great tip, Maggie – thanks for sharing! I love that you have a freezer full – it’s so good! Great substitutions – thanks so much for sharing. Glad it was a hit at your house too. You asked a question about using the crock pot year round. 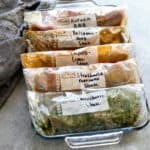 I do, there are a lot of recipes that are so easy in the crock pot, do a whole chicken and then make bone broth from the left overs is one of my favorites, then I put the broth in quart jars and freeze it. Put food in forget about it and have a great meal at the end of the day, what’s not to love about using the crock pot? I also use mine year round – it’s such a time saver to roast a whole chicken and then make the broth right afterwards. Though, admittedly, I use my slow cooker less often now that I have an Instant Pot. This reduces the time it takes to make a chicken from 4-5 hours to just 40 minutes and only 2 hours for broth – and it uses far less energy to do so. How do u cook the chicken in the instant pot? I just bought one and haven’t used it yet. Great question! I cook a pound of boneless, skinless chicken breasts on high pressure for 6-8 minutes then do a quick pressure release. For bone-in breasts or thighs you’d need to increase the cooking time to 10-15 minutes. 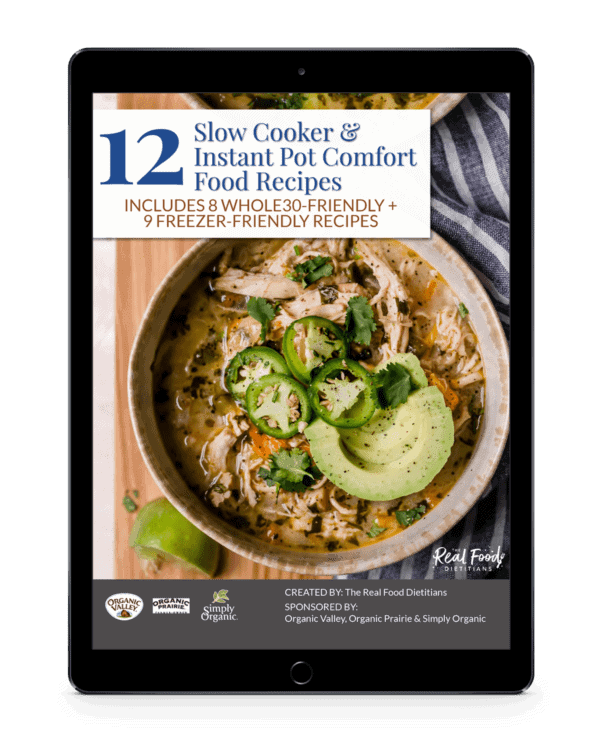 To make this recipe in the Instant Pot you’d want to combine all of the ingredients then use the ‘Poultry’ setting which is preprogrammed to cook for 15 minutes at high pressure then allow 10-15 minutes for pressure to naturally release. Release any residual steam, remove the lid then shred the chicken right in the pot! If the sauce seems too watery, press the ‘Saute’ button to cook off some of the excess moisture. If I double the recipe (= 2 lbs boneless/skinless chicken thigh), do you recommend I add more time to the Instant Pot, or still use the Poultry setting as is? Thanks!! Looks great! Do they reheat well? Thanks! They do reheat well. If you’re taking them for lunch you’ll want to pack the Ranch dressing separately so you can drizzle it over the potatoes after they’ve been heated. This recipe is a Whole30 favorite of mine! Instead of making my own ranch, I use Tessemae’s Whole30 approved ranch. It’s so easy to make and super delicious. My husband even likes it which is a huge compliment. This will be added to my recipe rotation for sure. We’re so happy to hear that a) the hubby liked it and b) that you’re adding it to your regular rotation – now THAT’S a huge compliment! 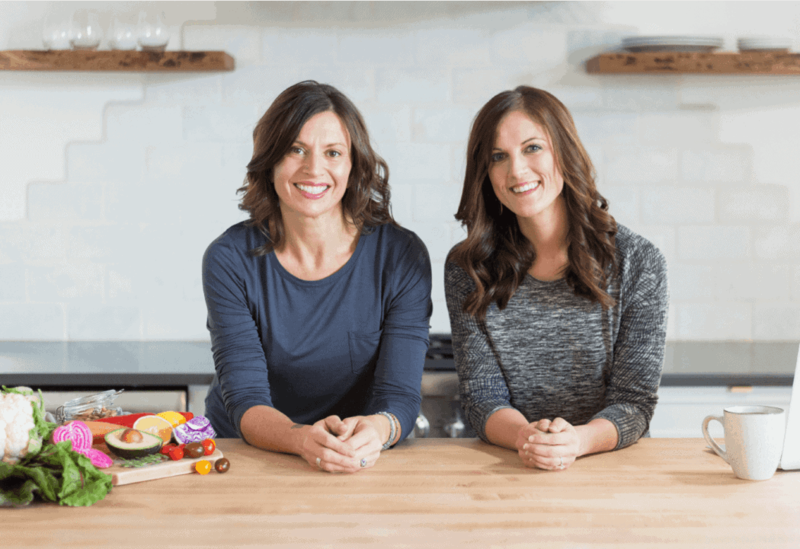 Using Tessamae’s Ranch is a great idea for saving time – Primal Kitchen also has a Ranch dressing that’s also Whole30-approved and uses avocado oil rather than sunflower oil. Thanks again for sharing your recipe success!! Had some shredded up rotisserie chicken from leftover from a Costco chicken. Baked a sweet potato in the oven (about 50 mins at 400 is how I do it). Heated up a skillet with some Kerrygold butter (not perfectly paleo I know), and threw in some garlic. The tossed in a handful of the shredded chicken and enough hot sauce to coat (I used Crystal brand which has no sugar). Dash of coconut aminos and some cayenne pepper (as directed in the recipe). Sauteed for a few mins and then threw on top of the potato and I topped with Primal Kitchen Ranch. So my “lazy version” took about 5 mins of active preparation and it was AMAZING! Thanks for the recipe! Your ‘lazy version’ sounds amazing – thanks for sharing!! Hello! I see this can be geared toward not using the oven on a summer day, however, I don’t see any instructions on how to cook the sweet potato? 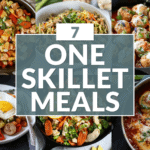 Is this done separately on your own and then topped with the chicken? Thanks! Hi I’m doing whole 30 and was wondering if you could freeze this meal for meal prep later on? Also if don’t have coconut aminos what would be gud substitute? Hi Meagan! I actually forgot to add the coconut aminos once and it still tasted super good! I noticed it just a little bit that it was missing but the hubby had no clue 😉 Enjoy! Yes this meal is freezer friendly. I’d suggest making the recipe first and then freezing the chicken in a sealed container or freezer bag. When you want to make it, thaw it out in the fridge overnight and then slow cook it on low for 4-6 hours or heat it up on the stove. This looks awesome! Planning on making it tomorrow night but was hoping to use my instant pot instead of the slow cooker…how would/could you modify it for that? You can add the chicken and sauce to the InstantPot then use the ‘Chicken’ button (15 minutes at high pressure). You can either do a natural release or quick release – then switch to saute mode to reduce the juice if needed once you’ve shredded the chicken (either in the pot or by removing it to a cutting board). Hope that helps! I am so happy I found your page, I absolutely LOVED this dish. I made if for dinner the other night and couldn’t wait to have the leftovers for lunch yesterday!!! And that Ranch dressing,..OMG so good. I actually put that on a burger that I was having with tomato, pickle and avocado. It added such a nice zing. I love that I can replace my ketchup with that. Thank you so much for sharing. I am looking forward to what you have in store for me tonight. We’re thrilled that you found us and that you found this dish and our ranch dressing to be so amazing. We hope you find more great recipes on our site – thanks for being a valued reader! Hi! I was wondering about the sweet potato…the recipe calls for them but the directions don’t say anything about cooking them. I assume they are cooked. But are they cooked with the chicken in the crock pot or totally separate? Please share. The sweet potatoes are cooked separately then you stuff them with the filling. I have made the chicken from this dish twice in the last week! We have put the chicken on top of salad, nachos, and in wraps. I doubled the chicken and used 1/3 cup siracha and a 1/3 cup hot sauce. So flavorful! Yesssss! I love the idea of using it on a salad or nachos. Would you use tamari instead of coconut aminos? Couldn’t find them yesterday and don’t have time to make it Whole Foods as I want to make this today! Looks delicious! Thanks! Yes, you can use tamari in place of the coconut aminos but I’d use roughly half the amount called for in the recipe, replacing the rest with water (because tamari is so much saltier). Any adjustments​ for using bone in cut up chicken? I don’t have time to skin & debone. If you’re using bone-in thighs or breast add an additional 4-6 ounces to account for the weight of the bone. You may want to consider removing at least some of the skin or the dish may be very greasy. Thank you so much for this recipe. It’s my whole 30 craving and I’m sure it will be when I’m done too. I’m on day 15 and tonight will be the 3rd time I’ve made it. Lol. Ha! It’s one of my ‘all the time’ cravings, too! Hi! If I wanted to make this recipe with 2 pounds of chicken, would I just double all the ingredients? 4 TB of ghee seems like a lot to me, so i’m not sure if I should double that ingredient. Yes, you’d double the recipe. You could use less ghee if you’d like but I wouldn’t use less than 3 Tbsp. Sorry to hear your sauce burned. I’ve had that happen a couple times when using chicken breasts that were a little dry (or I patted them dry) – My fix was to add just a bit of water to the pot along with the sauce and it fixed the issue. hi, could you cook the chicken in crockpot on high, instead of low? Yes you sure could. You’ll just want to reduce the cooking time to 2-4 hours or until chicken is cooked through and easy to shred. Made this tonight!! So yummy! I loved pairing the sweet and spicy flavors together. Who knew something healthy could taste this good?! I topped mine with some chopped green onions and it was perfect. Will definitely be making again!! Great to hear you enjoyed this recipe Jamie! Yes, I use my crockpot year round. Can’t imagine life without it! I absolutely love this buffalo chicken recipe!! It has become a staple in my home. Thank you so much for creating it and sharing it as well. Slow cookers are the greatest thing ever! Glad you love this recipe – it’s a staple at our house too. Hi! I’m just wondering what the spice level is for the recipe. I am trying to decide if it will be too spicy for my small kids. It’s not very spicy if you omit the optional cayenne pepper. Hope that helps! Delicious recipe 🙂 We’ve it 3 times in 2 months. That’s awesome 🙂 It’s on the menu pretty frequently at our house too. Could you replace the sauce mix with Tessemae’s Buffalo Sauce? wow…this was different but good! and super easy to make….the homemade ranch dressing really made this dish! Glad to hear this a regular at your house, too. The green stuff is chopped parsley. I’ve made this recipe 4 times in the last few months. It’s great!!! And love the ranch + sweet potato recipes too!! Quick question – I’m pre-making and freezing this weekend for a beach house trip next weekend. Won’t be taking my pressure cooker for warming… suggestions for re-heating that will recreate the recipe as close as possible?? I would reheat this by placing the thawed meat in a glass casserole baking dish, adding a bit of water and covering tightly with foil and warming in a 350F oven for 30-35 minutes or until hot. Alternatively, if you don’t want to turn on the oven then you can place the thawed (or partially thawed) meat in a large pot, add a little water, cover with lids and heat over medium heat (stirring and adding a little water as needed) until heated through. I hope that helps! 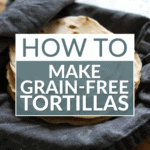 I needed a Gluten Free and Dairy Free recipe and I used this…but I had to make a substitution. Franks “Red Hot Sauce” is NOT Gluten Free, so be careful. I found a Buffalo Wing sauce at the Grocery Store that I used as a substitution. Otherwise, it was delicious! I just made this for my family and everyone loved it! We always rate recipes at the end of the night and the boys said it was 6/5. It’s nice and filling it doesn’t even need a side. We cut the hot sauce in half and its a good thing we did because it was spicy enough for us. We also used half thighs and half breasts. I put it in the instant pot for an hour. What a great recipe. Do you know what the calories would be for just the chicken without the sweet potato??? We have not done the calculations for this. Feel free to plug the ingredients into myfitnesspal to determine what that would be. Thanks! I’ve only made this recipe in the Slow Cooker but I’d imagine it would work well in the IP, too. 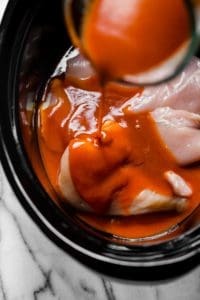 You could follow the instructions that are included in this recipe: https://therealfoodrds.com/instant-pot-bbq-pulled-chicken/ but use buffalo sauce. I use my slow cooker year round too! Next to the coffee pot, it’s my favorite appliance, and the only way I cook chicken (I tend to ruin it). I’m looking forward to trying this out. Oh yes…the coffee pot is used daily at my house! Thanks for sharing! I was looking over this recipe and comparing to the buffalo sauce recipe. I noticed that the apple cider vinegar is not included in this recipe? You’re right, it’s not. You can certainly add the vinegar if you’d like more tang but we found that the longer cooking time of the slow cooker resulted in that vinegar tang disappearing (funny things happen to flavors when slow cooking!). If you want that tang, we’d suggest adding a bit of vinegar to the cooked chicken and tossing well before serving. Hope that helps! So so great to hear!!! Everyone of my five family members LOVED this recipe and asked me to keep it in rotation. So simple and so delicious. Thank you! AWESOME!!! So great to hear. Back onto Whole 30 again and I have to say this is one of the best recipes I’ve found out there. A lot of times things will sound really good but the actual end product is not what I was looking for/expecting. This one is amazing. I halved it because there is only one of me, but this is just as good, if not better, the next day! Thank you!! Awwwwe…Thanks Mary! These are the comments that make our day! I have an instant pot & have not used it very much. I want to change that. 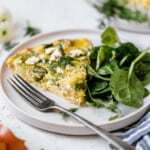 How would I go about using my instant pot for this recipe? Hi Erica. I have not made this recipe in the Instant Pot but if I were to I would add everything to the IP and set it on the poultry setting (or Manual if your version doesn’t have a poultry setting) for 15 minutes on high pressure. Once the time is up, let it naturally release for 5 minutes. Then switch the valve to vent to release the rest of the pressure. Next, shred the chicken and toss to coat. Hope that helps! Huge hit with my entire family!! Can I make the chicken not in a Crock-Pot or IP? How would you suggest I do that? We have not tested a stovetop or oven version for this dish so please keep in mind that this is only my educated guess. Place all ingredients in a Dutch oven with a heavy lid (or a glass baking dish covered tightly with foil). Place in preheated 275F oven and bake for 3-4 hours or until chicken is cooked through and you can shred it with two forks. Thank you! I’m looking forward to try it and will let you know the results! I am new to the cookers. Do you think I could do this in an instapot? It looks amazing!! You could! High Pressure or poultry setting for 15 minutes. Enjoy! Yes, just toss everything in the Instant Pot and cook for 8 minutes on ‘Manual’ or high pressure and allow for a 10-minute natural release. You can cook for 8 minutes on ‘Manual’ or high pressure then allow for a 10-minute natural release. What if my crockpot has these options: 4 or 6 hours on high, 8 or 10 hours on low? If I were to cut the recipe in half and use my crock- pot on the high setting, how long would it take to cook? I imagine it would take somewhere around 1 1/2 – 2 hours though I can’t be sure. You probably want to keep an eye on it to be sure it doesn’t overcook then you’ll know for next time. I’m gonna try this recipe coming weekend. Can we reheat and have it? Yes, you can absolutely reheat it. It will keep in the fridge for up to 4 days (and you can freeze it after that if you have any left).